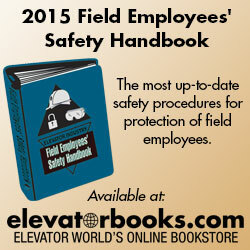 The NEII® Field Employee Safety Committee issues "position papers" on safety subjects not fully covered in the Elevator Industry Field Employees' Safety Handbook or on procedures that have changed due to OSHA standards. These position papers are reaffirmed and re-published each year by the committee. In some instances the information is incorporated into the Safety Handbook when a new edition is published then the position paper is eliminated from the list. Currently there are NEII® position papers on Confined Spaces, Forklift Training, Emergency Preparedness, Arc-Flash Hazards/Electrical Safe Work Practices and Asbestos Safety. Several new position papers are being worked on by the committee and will always be available in this spot. In addition to the Safety Position Papers, NEII® has made two training matrices available in the same area. (OSHA 1910 General Industry Mandated Training Requirements and OSHA 1926 Construction Industry Mandated Training Requirements).